On Saturday, 15th September 2012 the LivetoGive team headed to Wandsworth Common for a fantastic game-show inspired fundraiser challenge. 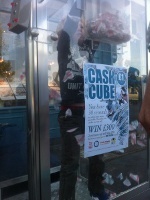 As part of this year's Bellevue Fair - a local event showcasing the diversity and produce of Bellevue Road - LivetoGive threw down the gauntlet to passers by with the marvellous Cash Cube. 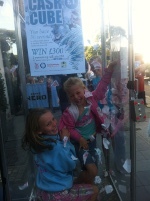 Participants stood a chance of winning up to £300 by catching as many flying papers as possible within 30 seconds. We have chosen a few of the best photos from the day for you on our Facebook page. The event was a huge success, the weather was wonderful and we raised an incredible £150 for our four brilliant charities!